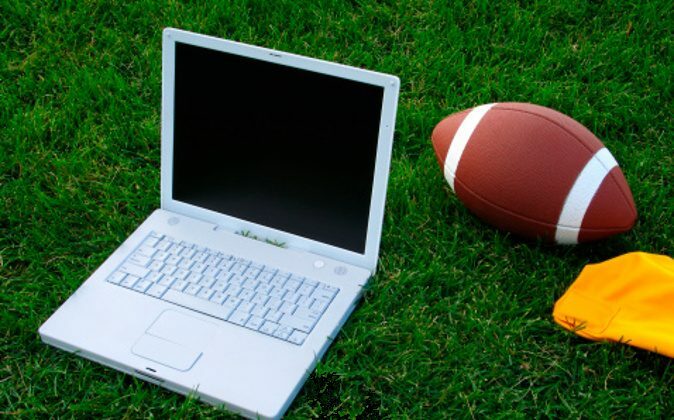 This color photo shows a closeup view of a white laptop computer, a football, and a bright-yellow penalty flag on a deep-green grassy football field in an attempt to create a fantasy-football concept image. The grassy turf fills the entire background of the image. Value based drafting (VBD)—a concept introduced by fantasy football guru Joe Bryant in 2006—has since become a prevalent draft day strategy among fantasy enthusiasts. Of course over time, the limitations of value based drafting have started to become apparent. For instance, its effectiveness is uncomfortably dependent on projection accuracy, which is indeed a valid criticism. So the purpose of this column is not to promulgate VBD as the best draft strategy, but rather to further perfect and build upon the tenets that Bryant introduced nearly a decade ago. As a refresher, VBD is the idea that the most valuable players are not the players who score the most points, but those who score the most in relation to other players at their position. To determine this, Bryant recommended using a “baseline” of the first 100 picks taken in the draft. So if we suppose that 15 quarterbacks and 35 running backs are taken within the first 100 picks, then you would be drafting quarterbacks based on how many more points they are projected to score than the #15 ranked quarterback, and running backs in relation to the #35 ranked running back. The amount of points above baseline for each player is their “X” value. For a more systematic review of VBD, one can consult Bryant’s original article here. Give a very rudimentary outline of a possible fix. There are three key issues Bryant’s VBD does not adequately account for. The first issue is that the very point differences VBD tries to exploit are already controlled for to some extent by the market. For instance, if Rob Gronkowski is projected to perform much better than his tight end peers, then the amount of draft slots between him and the next tight end will surely be greater than if they were expected to perform similarly. Bryant also himself concedes that we see the principles of VBD in play in how the top kickers are not drafted until later into the draft. This is also the reason why running backs are always projected at the top of the draft. This is to say that the market already controls for this to some extent. Of course, VBD does take into account average draft position (ADP) and drafting players who are a coup; if you project player A and player B to have the same X value but player B is projected to be picked two rounds later, then you will pass on player A and target player B. But this is no different from standard draft practices which use projected point totals rather than X values. The point is, the effect that the extra step of calculating X values and ranking them has is not as great as you would think due to market controls. The second factor Bryant’s system does not account for is variance. Lets suppose that QB and RBs 10-17 are projected in the same range of the draft. Using Bryant’s approach of ranking X values from greatest to least and taking the highest value, you would always prefer the quarterback over his correspondingly numbered running back. But the whole point of VBD is to gain a concrete advantage on a position by position basis. I want to ask, how much of an advantage are you really gaining by drafting QB10 versus the guys who draft QBs 11-17? Of course, this is somewhat of an extreme example, and the market would attempt to control for this, but it illustrates a point. No matter how much the market applies its controls, there will inevitably be different levels of variance between players of different positions at different points in the draft. In order to evaluate variance as described above, we need to split our players into tiers, or appropriate groups in which this type of analysis can be done. This brings us to a third factor that Bryant fails to address: variance between groups of players over the landscape of the draft. This time we have taken real data for the wide receiver position. The players are color coded into three tiers and listed are the player’s ADP and two sets of X values. The first set of X values (third column) are calculated using the player’s consensus projections—the player’s average projected point total across various fantasy platforms such as ESPN, Yahoo, and NFL.com. The second set of X values are calculated using hypothetical projections, or essentially made-up projections. In our hypothetical projections, we are predicting that the guys in the second tier will perform much better than the major fantasy platforms are suggesting. Looking at the data, it shouldn’t be hard to see why tier 1 is much less valuable under the hypothetical projections. From another point of view, the further a tier is from our tier of interest, the less impact it has on the value of the tier of interest. For instance, if it was tier 3 that had inflated values instead of tier 2, tier 1 wouldn’t be impacted as much and would maintain its value, which lies in the rift in X value between it and tier 2. From these examples, it shouldn’t be hard to see why Bryant’s method of setting a single baseline doesn’t work. Overall, what VBD set out to do was use our understanding of value to exploit inefficiencies in the player market. But from the above three points, we see that VBD still mostly falls within the parameters of the market and does not actively make said exploitations. So we need to find ways to address the three factors mentioned above. Note that for our solution, we are throwing X values completely out the window and taking the standard approach of using projected point totals. For baseline players, we prefer to use the values set in Frank Dupoint’s Value Based Drafting Revisited as it more accurately takes into account supply and demand for each position than the traditional top 100 approach. There are various things we are keeping though: we will still be using ADP to rank players, we still require that owners make their own player projections, and we still make a point of comparing players of the same position. Firstly, we have conceded that the market already tries to control for player value by distancing players with greater point disparities. But the key is, it cannot do this perfectly. For instance, we can plot ADP by projected point totals for the quarterback position, and draw a linear line connecting the point totals of QB1 and the baseline QB. We consider this line “market value”. You will then see that there are points that lie above, on, and below the line; values above this line are above market value, and values below it are below market value. To trick is to see where the market errs in its projections. From this example, we see that we want to target QBs in the 11-30 and 70-90 range, and we want to avoid QBs in the 40-70 range. These types of charts also allow you to clearly see who your ‘value picks’ are. RGIII’s current ADP is 150+, but if you predict that he will turn things around and finish a top 5 QB, the data point for RGIII will soar above the market line. Its worth nothing that if we were to really get into this, there would be many additional things that one would have to account for, such as outliers (outliers will affect the mean line), and cases where personal projections differentiate exceedingly from standard projections (you have many low ADP players outperforming high ADP players), etc. But again, we are mapping a general outline of a solution rather than giving a comprehensive one. In any case, should we just create charts like this using real data and solely draft players above market value? Not necessarily, as again there is the issue of variance mentioned earlier. We have posted another example below for those that need it. (Here, RB15’s +/- value is not as high as RB6 and RB7, but he is arguably the top choice in this pool. This is because we hold that in value based drafting, the goal is to obtain a concrete advantage over your opponents, and this is never clearer than when the player you drafted is valued significantly higher than players of the same position drafted in close proximity). To evaluate our first type of variance—variance within groups—there are two things we must do. Firstly, we have to figure out relevant “chunks” to split our pool of players into for each position. Again, I don’t have a set approach—one could perhaps consult tier-based draft strategies. One possibility are players whose ADP falls within the same round, as that pits you against each of the other nine owners at once (considering a 10 team league). Another is 10 player tiers. For example, RB1-10, RB11-20, etc., as hypothetically, each of every 10 running backs is distributed to each of the 10 owners. Secondly, once these chunks are finalized, there has to be some sort of formula that gives each player a score based on how they compare to the players within their tier. The most simple, top-of-the-head approach would be standardization. Similarly, a score is needed for variance between groups. So every player within the same tier would receive the same score for this category. A final formula is needed to combine +/- market value, within group variance, and between group variance. Or perhaps a formula isn’t needed; you could possibly have the three values side by side and decide intuitively on which player is better based on the three values. For the formula, a majority of the weight should go to +/- market value. Based on our discussion, there is still a ways to go if we want a methodology that squeezes maximum value out of a fantasy draft. At this point, it really becomes a fairly advanced statistical problem. Bryant introduced VBD in order to give fantasy players an edge, so we have taken an exploratory approach in finding its shortcomings, and what steps may be needed to improve upon them. The point is, though we have not provided a concrete alternative, factors like variance will inevitably have to be addressed if we wish to truly maximize value. We ultimately hope this column can spark further discussion on how to maximize VBD and even on whether its worthwhile to do so considering the evident flaws of VBD. The #11 overall draft picks of the past decade ranked in order from best player to worst. What happened to the Rivals top 100 for the class of 2009? In retrospect, how accurate are Rivals rankings in determining future professional prospects?